Nearly 800,000 people suffer strokes in the United States annually, and more than 80 percent of these individuals experience a motor deficit as a result. Reduced motor function negatively impacts independence and overall quality of life for millions of survivors around the globe. Fortunately, it is possible to reduce or even eliminate many stroke-related impairments with mirror box therapy, an innovative treatment designed to encourage neural regeneration in regions of the brain that control motor function. Mirror box therapy empowers stroke survivors with the dexterity and motor skills necessary to regain their independence. This guide is designed to answer some of the most frequently asked questions patients have about this revolutionary treatment: What is a mirror box, and how does mirror therapy work? How Does Mirror Therapy Work? Strokes are one of the main causes of disability around the globe. Both hemiplegia (paralysis on one side of the body) and hemiparesis (muscle weakness on one side of the body) are common following a stroke. According to the Journal of Physical Therapy Science, about 85 percent of stroke survivors will suffer from hemiplegia, and at least 69 percent will experience a loss of function in the upper limbs. This reflection, and its corresponding illusion, “tricks” the brain into believing the impaired limb is functioning. While the underlying mechanism is not fully understood, it is believed that mirror neuron activation plays a central role in the positive effects of mirror therapy. To begin explaining why mirror therapy is effective, we must first go over the fundamentals of neuroplasticity and neuron mirroring. “Because of this belief, scientists also thought that if a particular area of the adult brain was damaged, the nerve cells could not form new connections or regenerate, and the functions controlled by that area of the brain would be permanently lost. However, new research on animals and humans has overturned this mistaken old view: today we recognize that the brain continues to reorganize itself by forming new neural connections throughout life. This phenomenon, called neuroplasticity, allows the neurons in the brain to compensate for injury and adjust their activity in response to new situations or changes in their environment,” as noted in a report by Huntington’s Outreach Program for Education at Stanford. This ability to reorganize means that it is possible for the brain to adapt after experiencing a trauma, such as a stroke. To induce this neural regeneration, mirror therapy must first activate the neuron mirroring network — a complex system involving mimicry and human learning. The mirror neuron system “is activated when an individual observes an action performed by another person. Furthermore, its activation does not depend on memory; i.e., the mirror neuron system is able to identify action complexity, and it unconsciously imitates what we see, hear or perceive,” per the International Archives of Medicine. That’s how the visual feedback of a normal, unaffected limb’s movement reflected in the mirror spurs activity in the somatosensory cortex, triggering neuroplasticity. This stimulation then triggers the affected side of the brain to move the affected limb. “Visual illusions make the patients feel as if their two hands are moving simultaneously and symmetrically. The visual illusions are activated in the cerebral hemisphere, and this activation functions as the basis of a neurological mechanism for inducing brain plasticity,” says the Journals of Physical Therapy Science. Mirror therapy exercises are designed to harness neuron mirroring to activate neurons in the affected area of the brain, and eventually increase the dexterity, accuracy, and velocity of impaired limbs. To help a patient begin a structured mirror therapy regimen, a medical professional will first describe mirror box therapy protocol, and then guide the individual in a series of mirror therapy exercises. These exercises have been shown to help individuals with motor deficiencies regain dexterity and strength. These exercises are designed to eventually be self-guided in the stroke survivors home and facilitate continued progress. There are a few things to keep in mind when performing mirror therapy exercises. Once the mirror box is in place and the survivor is comfortable, it’s imperative that he or she spend a few minutes observing the reflection of the mirror box, to set the stage for the optical illusion. It can be helpful for patients to imagine that they are looking through a window instead of at a reflection. Because mirror therapy is designed to treat motor impairment, it’s important to remember that this treatment is rooted in “the basic principles of motor learning: a high number of repetitions combined with variation of the movement performance,” according to Mirror Therapy: Practical Protocol for Stroke Rehabilitation. These simple movements may include making a fist, touching the tip of each finger to the thumb, or using just the fingertips to crawl along the surface of the mirror. Eventually, these exercises will progress to more complex functional tasks with objects, such as using a washcloth to slowly rub a flat surface, picking up a number of coins, or mimicking pouring the contents of one vessel into another. Handwriting is another common exercise, and can be performed with the non-dominant hand if the impairment has affected the dominant one. For optimal results, these exercises should be performed slowly and consistently, with at least 15 repetitions per exercise. A typical mirror therapy session should last about 30 minutes, but patients can split this time up into three 10-minute or two 15-minute sessions, if preferred. Therapist-guided treatment is crucial for teaching the core principles of mirror therapy, but the goal is that survivors can later apply these principles in self-guided mirror therapy sessions at home. When the patient is ready for self-guided mirror therapy, the therapist may provide a list of specific exercises and instructions to follow. Additionally, the therapist may ask the patient to keep a log of these self-guided treatments. This log should include the time, repetitions, progress, and even any side effects of mirror therapy. For best results, patients should devote at least 30 minutes per day to mirror therapy, in a quiet space free of other distractions, where they can give the process their full attention. Mirror therapy stroke exercises should be performed for up to six weeks before the therapist can determine the efficacy of treatment. For patients exhibiting consistent negative side effects, the therapist may suggest discontinuing mirror therapy. Common negative side effects are generally mild and may include dizziness, nausea, and confusion. If these side effects occur, the patient should look away from the mirror and focus on another part of the room until the symptoms have passed. Every stroke is different, and while mirror therapy has proven to be an effective treatment for stroke-related motor impairments, it isn’t necessarily right for everyone. Mirror therapy requires specific physical and cognitive capabilities, which can make it inappropriate for some patients. Individuals with severe disabilities following a stroke, or as a result of another condition, may not be able to perform effective mirror therapy. Per mirror therapy protocol, treatment suitability is based on three overall dimensions: affective, cognitive, and physical abilities. Patients will need to be able to follow the guidance of the therapist during treatment, and also administer self-guided mirror therapy at home. For this reason, mirror therapy may not be suitable for individuals with severe cognitive disabilities. As explained previously, the non-affected limb plays a key role in mirror therapy, so this limb should ideally have a normal, pain-free range of motion. An unaffected limb with severe motor impairment of its own may hinder mirror therapy performance, and pain during movement can be a serious distraction for the patient. Furthermore, because mirror therapy is dependent on the patient’s brain processing the reflected image, those with severe vision impairments or attention deficits may not benefit from treatment. If an individual is not capable of sitting upright without supervision, either due to a lack of trunk control or some other condition, mirror therapy is not recommended. For effective mirror therapy treatment, patients should minimize any identifying or differentiating marks on the hands. Jewelry should be removed, and patients with tattoos, birthmarks, large moles, or scars should cover these areas with makeup or wear a glove during treatment. Mirror therapy is not suggested for patients with severe claustrophobia. For nearly two decades, Saebo has specialized in life-changing products designed to help patients with limited mobility. During this time, Saebo assistive devices have helped more than 100,000 individuals worldwide surpass their “functional plateau” en route to living a fruitful, functional, and independent life after a stroke. Saebo now offers a mirror box product that is evidence-based and easy-to-use, with the Saebo name that is trusted by survivors and providers alike. The Saebo Mirror Box is an intuitively engineered Mirror Therapy Box designed for ease of use, convenient setup, streamlined stowing, and, most importantly, optimal motor skill treatment. The Saebo Mirror Therapy Box doesn’t require a prescription, meaning patients can order it like any other consumer good. 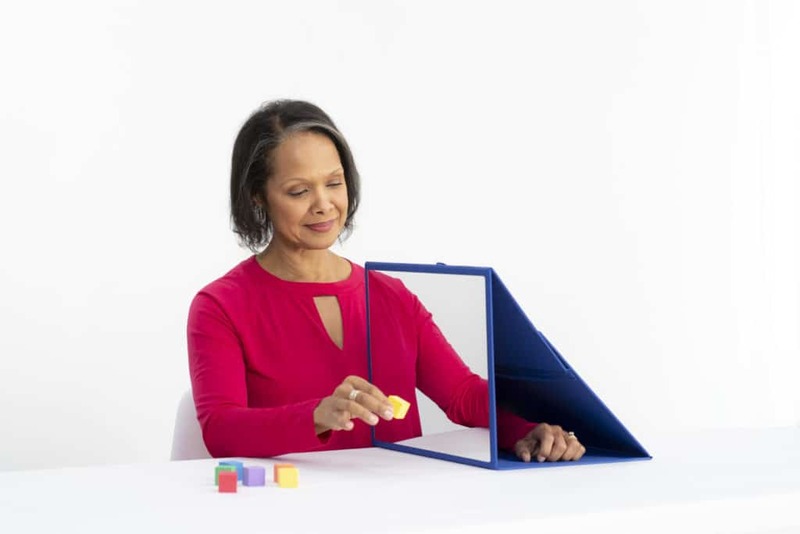 For ease of transport around the home, to the office, or anywhere else, this mirror therapy box is lightweight and collapsible. Once a medical professional has empowered the patient with the tools and principles of proper mirror therapy, this mirror therapy box enables that patient to perform self-guided treatments from the comfort of home. Whether a patient is still in the recovery stages of a recent stroke or struggling with motor deficits years later, it’s never too late or too early to start thinking about effective treatment. Retraining the brain after a stroke is possible with the right equipment and proper guidance. Here at Saebo, we are committed to stroke support and recovery for all survivors and their families. Saebo offers a wide range of products that combine cutting-edge technology with evidence-based rehabilitation techniques. Our offerings and network of Saebo-trained therapists can help you or a loved one to obtain all the necessary tools to maximize stroke recovery.